We see also that the greater danger does not come from outside us. It comes from within. It comes from our very selves. The enemy is within us. Within us is the very progenitor of our error; within us, I say, dwells our adversary. Hence, we must examine our aims, explore the habits of our minds, be watchful over our thoughts and over the desires of our heart. Let us therefore not seek for causes outside ourselves nor blame others for them. Let us acknowledge our guilt. For we must willingly attribute to ourselves, not to others, whatever evil we can avoid doing when we so choose. St. Ambrose (Bishop of Milan), The Six Days of Creation 1, 31-32. Again, I found this bit of wisdom in the Readings for the Daily Office from the Early Church. 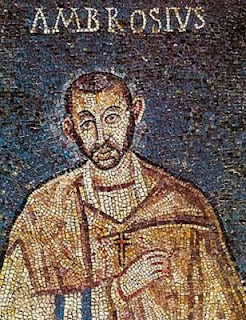 St. Ambrose was the Bishop of Milan, and lived in the fourth century. He fought against the Arian heresy (which held that Jesus had not existed eternally and was subordinate to God the Father). He often stood against imperial authority and was one of the four original Doctors of the Church. Ambrose rightly points to one of our great shortcomings: our willingness to justify ourselves by blaming others. It’s a very old problem, dating back to the first sin recorded in Scripture. When God asks Adam whether he has eaten of the tree of the knowledge of good and evil, Adam replies: “The woman whom you gave to be with me, she gave me fruit from the tree and I ate.” Gen. 3:12. Adam thus inaugurates our primary strategy for dealing with sin: justifying ourselves by spreading the blame. In essence, Adam said that Eve bore the real responsibility for this offense, along with God who gave her to him. Scripture offers a very clear witness on this point. Jesus asked, “Why do you see the speck in your neighbour’seye, but do not notice the log in your own eye?” Luke 6:41. Perhaps more to the point, St. John reminds us: “If we say that we have no sin, we deceive ourselves, and the truth is not in us.If we confess our sins, he who is faithful and just will forgive us our sins and cleanse us from all unrighteousness.” 1 John 1: 8-9. Our desperate efforts to justify what we’ve done, to justify ourselves before the Almighty, place our souls in grave peril. Christ invites us to drink from the cup of forgiveness, and yet we turn away and deny that we are thirsty. As C.S. Lewis observed: “We poison the wine as He decants it into us; murder a melody He would play with us as the instrument…Hence all sin, whatever else it is, is sacrilege.” We want so fiercely to be “good” people, and perhaps even more frantically to appear to be “good” people. I think in part we feel this way because we do not really trust in God’s infinite capacity to love and forgive. I wonder, at our core, how many of us really trust God? The psalmist wrote that our Father would not refuse a broken and contrite heart. The real risk to our spiritual lives lies, as St. Ambrose observed, lies in our stubborn insistence on externalizing evil, rather than recognizing the ways in which we’ve separated ourselves from God. This entry was posted in Uncategorized and tagged Adam and Eve, Anglican, Bible, Disciple, Bible, C.S. Lewis, Christianity, Dominican, Episcopalian, Forgiveness, Genesis, Jesus, Lent, Moral Theology, Religion, Scripture, Spirituality, St. Ambrose, Theology. Bookmark the permalink. Harsh words to hear, my brother. Thank you. I’m sorry you found it harsh, Sister. I did not intend it thus. Do not misunderstand me, Brother. I love your words! I, for one, need to hear them often! I find comfort in them. As usual, you’ve given us much to think about and take to heart. What sticks with me especially is the thought that we don’t trust God enough, or else we wouldn’t strive so hard to be (or at least to appear) “good people.” I’ve never considered how those two things might be linked, but it makes sense. Of course, seeing the truth of your words is (as always) the easy part. May God give us the grace to respond faithfully. Thank you, as always, for your kind support and encouragement. At least in terms of numbers, this Lenten series isn’t doing so well, but I’m glad the piece spoke to you. Those pesky numbers! I started taking them a little too seriously lately, but Constantina straightened me out. Please know that, even when our numbers are few, we’re at least passionate. What an excellent word for us today, Brother James. A great encouragement to see myself in reality, not who I pretend to be… often at other’s expense. God bless these inspiring words, friend. Again you’re very kind. I appreciate your support. I promise you, I can only write about pretending to be something I’m not from experience….all too recent, I’m afraid. Thanks, Brother. I think your words resonate with your readers so profoundly because we do sense our shared brokenness and this “shock of recognition” is life-giving. I’m not sure I understand your comment about numbers, but I love your quality and if I were you I wouldn’t worry about quantity. Thanks so much for your kind words, and for your regular support on Unapologetically Episcopalian. It means a good deal to me. I hope all’s well with you, and wish you a good and holy Lenten season. The Lord bless you brother James… The man with a pure eye sees nothing but Good in a brother..thanks for being that man! Thank you for the blessing and for your regular support.